The Taker by Alma Katsu was a book I enjoyed for its paranormal elements, but also for its characters, Adair — who seemed like evil incarnate — and Lanore — a young woman obsessed with the local hottie. This novel is for adults, plain and simple, but it’s not just vampire or werewolf fluff. It is much more. A combination of historical fiction, paranormal magic, and romance, with a great nod to some literary greats, including a personal favorite of mine, Edgar Allan Poe. Check out more with my review. The Reckoning by Alma Katsu continues the journey of Lanore as she travels the globe and hide from Adair and his wrath. Believe me when I tell you that Adair is not an immortal man you want to make angry. For a second book, I was in awe — totally blown away by the characters and the story’s arc. Learn more with my review (though beware of spoilers). Ok, so you’re probably wondering why I’m talking about these books and not about the final book, The Descent. I have to wait for its publication, that’s why! In the meantime, I’ve joined Adair’s Companion Club! I’m actively soliciting companion’s for Adair and The Taker series because “50 shades” has nothing on him or these books. As a companion, you get to talk about the books, promote local events where Adair and the books come together, and more. Check out the information on Alma Katsu’s blog to learn more and sign up for her newsletter. Let us convert you with some decadence. September is a good month to watch the leaves change, experience the cool down in temperatures, and enjoy the local and not-so-local authors attending the book festivals in the Washington, D.C., area. While most know about The National Book Festival, Virginia’s Fall for the Book Festival at George Mason University started this week on Sept. 26 and continues through this weekend. Among the authors expected are Neil Gaiman, Michael Chabon, Rita Dove, Alice Walker, Katherine Boo, Karen Russell, and Amy Waldman. Over six days, readers and writers have the chance to meet 150 authors. Alma Katsu, whose books (The Taker series) have been reviewed here, will be participating on a literary and genre fiction panel hosted by the National Book Festival that also features novelists Julianna Baggott and Louis Bayard as well as Salon.com founder and critic Laura Miller on Sunday, Sept. 30 at 1:30 p.m. in the Johnson Center on Mason’s Fairfax Campus. In addition to literature, Fall for the Book Festival also offers panels on the election and how to tap political independents and navigate the political landscape as well as a higher education panel to look at the challenges ahead for universities. Today’s events will be headlined by Neil Gaiman, author of Coraline and The Graveyard Book, and at 7:30 p.m. he will receive the 2012 Mason Award for “extraordinary contributions in bringing literature to a wide reading public.” From memoirists to novelists and short story writers, today’s events offer a great deal for readers to check out, including a screening of The Color Purple at the Johnson Center Cinema and poet Cathy Park Hong. On Saturday, Sept. 29, readers and families can attend the regional library book sale, a children’s book panel, a superheroes panel, a poetry reading, as well as the opportunity to visit with Laura Lippman, learn about political thrillers, and much more. On the final day of the festival, attendees can hear from Congressman Tim Ryan, check out the George Mason Alumni Reading, and check out writing from student writers at the Falling for the Story event. Check out the full schedule. In addition to the Fall for the Book festival in Virginia, the D.C. area also can enjoy the Baltimore Book Festival, typically held during the same weekend as last weekend’s National Book Festival, starting today. This weekend, the Baltimore festival brings back Free Friday Feedback at 12 p.m., in which unpublished writers can bring three poems or up to five pages of double-spaced prose for some on-the-spot commentary from published writers. From book sales to performances by the Baltimore Public Schools, the festival offers entertainment focused on books, music, and more. On Saturday, Sept. 29, during the My America Playwrights panel, Neil LaBute, Christopher Durang, and Lydia Diamond will talk about their roles as writers in theater and what it means to be a playwright. At 12 p.m. a tribute to activist poet Lucille Clifton, sponsored by Little Patuxent Review, will likely draw a big crowd, though it will have to compete for audience with Emily Giffin, whose books have become popular, including her latest book, Where We Belong. And as always, there will be a literary walking tour, local businesses displaying their products and services, and panels on women’s fiction, young adult romance, steampunk, and how to cross genres. On Sunday, Sept. 30, the Maryland State Arts Council (MSAC) will showcase the winners of the annual Individual Artist Awards for playwrights, and the Hope Family Choir will offer the soothing sounds of contemporary gospel music. At 2 p.m. there will be a musical library tour, and Annie Barrows and Sophie Blackall, the creators of Ivy and Bean, will unveil the latest book in the series, Ivy and Bean Make the Rules. Maryland native Michael Tucker, former L.A. Law attorney Stuart Markowitz, returns to talk about his debut novel, After Annie. And if you miss Laura Lippman at the Virginia Fall for the Book Festival, you can catch her in Baltimore. Check out the full schedule. This weekend is shaping up to be the best in books and reading all year. There are some books that you read quickly through and there are those books are almost too seductive and you want to slow down and savor every moment with the characters, and The Reckoning by Alma Katsu — the second book in The Taker series (check out my review of The Taker) — is the latter. Once plunged into this world of immortal, devilish, and sometimes wayward beings, readers will not want to leave and by the end of the book, they will be clamoring for more. The novel picks up just where Lanny and Luke leave off in the previous novel, and just as he begins to settle into their new life together — helping her to purge her past — the unthinkable happens. The terror Lanny feels is palpable and forces her to take action in a way that she never thought she would, leaving Luke devastated. What makes this all work so well is the tables are turned not just on Lanny forcing her to react, but the tables turn on other characters as well, including the powerful and frightening Adair. The Reckoning is not only about the revenge that Adair will take upon Lanore and the events that lead her back into his path, but also it is about the judgment we all must make of ourselves, our past deeds, and our future path. Readers will uncover more of Adair’s secrets, learn about the great Lord Byron, and come to find out that Lanore is not as immune to the charms of the dark side as she’d like to think she is. There is a great blurring of the line between good and bad, with each character playing along the edges in their actions and thoughts. Lanore’s character grows stronger here, burning with fear, yet conviction, while Adair’s softer side is revealed without taking over. Katsu does well to blur these lines and show us the reality of this surreal world — that not everything is as black and white as it seems (dare I use the pun that there are more than 50 shades of gray?). 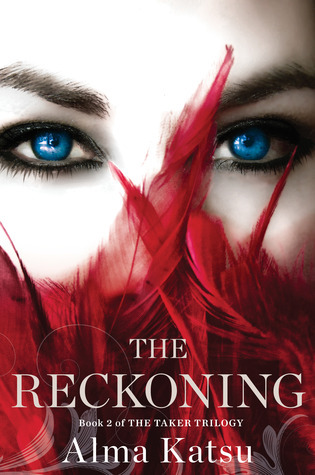 The Reckoning by Alma Katsu is an addictive world that readers will plunge into without looking and emerge from emotionally spent and eager for the next whirlwind with The Descent. Katsu is a phenomenal writer who is adept at building worlds and atmospheres that will hold readers in their grip and never let go, and many of these worlds straddle reality and fantasy like no other. History, even its alternate versions, come to life in her hands as her characters run through the pages, fearing the worst and never expecting redemption. She’s made me into a believer, enticing me back into the world of fantasy, horror, and, dare I say, the Gothic, which I had given up as trite and overwrought long ago. I’ve been seduced. The Reckoning by Alma Katsu is one of the best books I’ve read this year, and I don’t say that about many sequels. Alma Katsu is a 30-year DC veteran who lives in two worlds: on one hand, she’s a novelist and author of The Taker (Simon & Schuster/Gallery Books). On the other hand, she was a senior intelligence analyst for CIA and NSA, and former expert in multilateral affairs. Check out this Interview With Alma. This completes my first series for the Finishing the Series Reading Challenge 2012. Mailbox Mondays (click the icon to check out the new blog) has gone on tour since Marcia at A Girl and Her Books, formerly The Printed Page passed the torch. This month’s host is Burton Book Review. 1. Monarch Beach by Anita Hughes, which I received for review. When Amanda Blick, a young mother and kindhearted San Francisco heiress, finds her gorgeous French chef husband wrapped around his sous-chef, she knows she must flee her life in order to rebuild it. The opportunity falls into her lap when her (very lovable) mother suggests Amanda and her young son, Max, spend the summer with her at the St. Regis Resort in Laguna Beach. With the waves right outside her windows and nothing more to worry about than finding the next relaxing thing to do, Amanda should be having the time of her life—and escaping the drama. But instead, she finds herself faced with a kind, older divorcee who showers her with attention… and she discovers that the road to healing is never simple. This is the sometimes funny, sometimes bitter, but always moving story about the mistakes and discoveries a woman makes when her perfect world is turned upside down. 2. The Reckoning by Alma Katsu, which arrived for review from her publicist. So Excited. Lanore McIlvrae is the kind of woman who will do anything for love. Including imprisoning the man who loves her behind a wall of brick and stone. She had no choice but to entomb Adair, her nemesis, to save Jonathan, the boy she grew up with in a remote Maine town in the early 1800s and the man she thought she would be with forever. But Adair had other plans for her. He used his mysterious, otherworldly powers to give her eternal life, but Lanore learned too late that there was a price for this gift: to spend eternity with him. And though he is handsome and charming, behind Adair’s seductive façade is the stuff of nightmares. He is a monster in the flesh, and he wants Lanore to love him for all of time. Now, two hundred years after imprisoning Adair, Lanore is trying to atone for her sins. She has given away the treasures she’s collected over her many lifetimes in order to purge her past and clear the way for a future with her new lover, Luke Findley. But, while viewing these items at an exhibit at the Victoria and Albert Museum in London, Lanore suddenly is aware that the thing she’s been dreading for two hundred years has caught up to her: Adair has escaped from his prison. He’s free— and he will come looking for her. And she has no idea how she will save herself. 3. Blood Line by James Rollins, which came unexpectedly from William Morrow and will be finding a new home. In a thrilling masterwork that will make you rethink your perceptions of life and death, New York Times bestselling author James Rollins takes you to the edge of medicine, genetics, and technology, revealing the next evolutionary leap forward: immortality. Galilee, 1025. Infiltrating an ancient citadel, a Templar knight uncovers a holy treasure long hidden within the fortress’s labyrinth: the Bachal Isu — the staff of Jesus Christ — a priceless icon that holds a mysterious and terrifying power that promises to change humankind forever. A millennium later, Somali pirates hijack a yacht off the coast of the Horn of Africa, kidnapping a young pregnant American woman. Commander Gray Pierce is enlisted for a covert rescue mission into the African jungle. The woman is no rich tourist: she’s Amanda Gant-Bennett, daughter of the U.S. president. Suspicious that the kidnapping masks a far more nefarious plot, Gray must confront a shadowy cabal which has been manipulating events throughout history…and now challenges the current presidency.